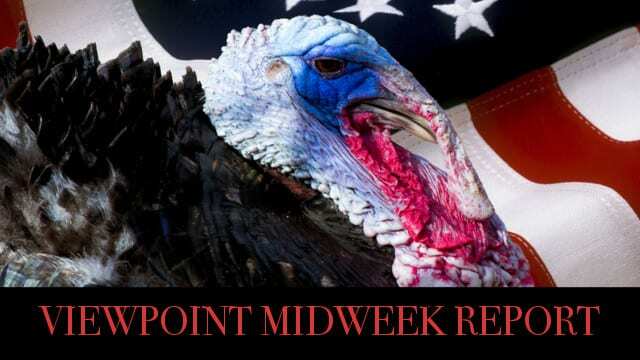 Viewpoint, The MidWeek Report – Some might call it dysfunctional, others a loving tribute to the Bundy Family. A Thanksgiving talk that is sure to open minds and hearts alike. We are also honored to welcome Sid Bowdidge to the table and to tell us about his incredible journey with President Trump. Oh, and not to worry, we have the Top News Stories covered as well. Subscribe to Viewpoint on Apple Podcasts by clicking here. A powerhouse of talent, Ilana Freedman and Dennis Santiago provide excellent analysis on the top stories we are following on the Midweek Report. Prison Reform – Could it unite the Parties? Sid Bowdidge, like most of us, was just a regular guy who along the journey rediscovered his love of country, his patriotic duty to help elect a guy named Trump to the Oval Office, along with his newfound faith and love of God. It was a dream come true that would change his world forever. We are thrilled to have Sid join us today to share his incredible journey. The dinner table can be a spirited interchange between family members and friends who come together to give thanks or to debate the talent of Author Stephen King. They’ll certainly bring up California Rep. Eric Swalwell and his comments about gun owners in that the government has nukes!?! The conversation could even extend to the white women racist comments of CNN Commentator Kirsten Powers! Let’s not forget Nancy Pelosi’s desire to rule Congress again and the outspoken husband George of Kellyanne Conway, Trump’s top advisor. This will be a first. Will it be a one-time event or become an annual occurrence here at America Out Loud? Joining us for serious table talk at Thanksgiving with Sid Bowdidge, Dennis Santiago, Ilana Freedman, Jim McCay & Ava Armstrong.